G.P. Putnam's Sons, 9780425283172, 432pp. When New York journalist and recently bereaved mother Charlotte “Charlie” Cates begins to experience vivid dreams about children in danger, she’s sure that she’s lost her mind. Yet these are not the nightmares of a grieving parent. They are warnings that will help Charlie and the children she sees, if only she can make sense of them. After a little boy in a boat appears in Charlie’s dreams, asking for her help, she finds herself entangled in a world-famous thirty-year-old missing-child case that has never ceased to haunt Louisiana’s prestigious Deveau family. Armed with an invitation to Evangeline, the family’s sprawling estate, Charlie heads south, where new friendships and an unlikely romance with the estate’s landscape architect—the warm and handsome Noah Palmer—bring much-needed healing. But as she uncovers long-buried secrets of love, money, betrayal, and murder, the facts begin to implicate those she most wants to trust—and her visions reveal an evil closer than she could have imagined. A Southern Gothic mystery debut that combines literary suspense and romance with a mystical twist, The Gates of Evangeline is a story that readers of Gillian Flynn, Kate Atkinson, and Alice Sebold won’t be able to put down. Hester Young holds a master’s degree in English with a creative writing concentration from the University of Hawai‘i at Mānoa, and her short stories have appeared in magazines such as Hawai‘i Review. Before turning to writing full-time, she worked as a teacher in Arizona and New Hampshire. She is also the author of the forthcoming novel The Shimmering Road. Young lives in Lawrenceville, New Jersey, with her husband and their two children. "What a delicious book! 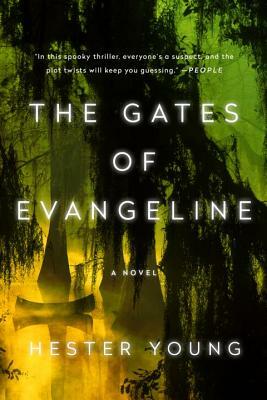 Gripping and atmospheric—with a heart-stopping twist—The Gates of Evangeline is an imaginative blend of southern gothic, family epic and spooky whodunit. Trust me: you won’t just read Hester Young’s debut, you will absorb this gorgeous novel using all 'six' senses." "Hester Young's The Gates of Evangeline is not just a riveting story about the search for a long missing child. It's also a powerful and haunting examination of a mother's grief and her long road to recovery. Hester Young's protagonist, Charlotte "Charlie" Cates, is tough and vulnerable, wounded and fearless, and I simply could not stop reading this thrilling, beautifully written Southern Gothic mystery. I can't wait for the next entry in this captivating new series." "Step through The Gates of Evangeline with Charlotte Cates, a grief-stricken Northerner tasked with uncovering a Southern dynasty's dark secrets. Hair-raising and heart-rending, Hester Young's first novel is one of buried shame, children taken too soon, and, ultimately, of immense true love that binds across the mortal divide." "The Gates of Evangeline is a wonderfully evocative, chilling mystery layered with themes of love, faith and devotion that is sure to haunt readers' dreams long after they've turned the last page." "...a thrilling Southern Gothic mystery. Full of family secrets, betrayals and unexpected romances, it pulls readers along on a dark, twisted ride through the Louisiana swamp."